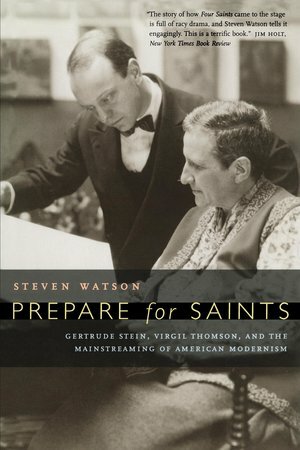 Perhaps the oddest and most influential collaboration in the history of American modernism was hatched in 1926, when a young Virgil Thomson knocked on Gertrude Stein's door in Paris. Eight years later, their opera Four Saints in Three Acts became a sensation--the longest-running opera in Broadway history to date and the most widely reported cultural event of its time. Prepare for Saints is Steven Watson's brilliant and absorbing account of how that revolutionary opera was born. Steven Watson is a cultural historian of the American avant-garde. He is the author of Harlem Renaissance (1995), The Birth of the Beat Generation (1995), and Strange Bedfellows: The First American Avant-Garde (1991).